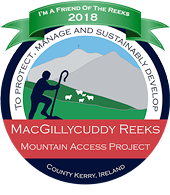 We are lucky to live in one of the most beautiful mountainous areas of Ireland and to be able to look out the window every day and see the amazing MacGillycuddy Reeks and Carrauntoohil is something we will never grow tired of. Like any mountain if you are planning a trek you need to be prepared and dress appropriately and most importantly be safe when you are there. There are various routes up Carrauntoohil and depending on weather and fitness levels your guide, Richard, will advise you on the best route for you and your group. The help you prepare for your day on Carrauntoohil I have listed a few items that you will definitely need. The journey will take 6-7 hrs (up and down including a lunch stop on summit) and this is based on reasonable fitness levels. You can click this link to view some of the traditional routes used. If you would like to book a day out up Carrauntoohil with us here at Morrison Tours or indeed a half day hill walking please send us a message on Facebook, twitter, email or by phone. We will be happy to answer any questions or concerns you may have. Enjoy the outdoors where ever you are and be safe.